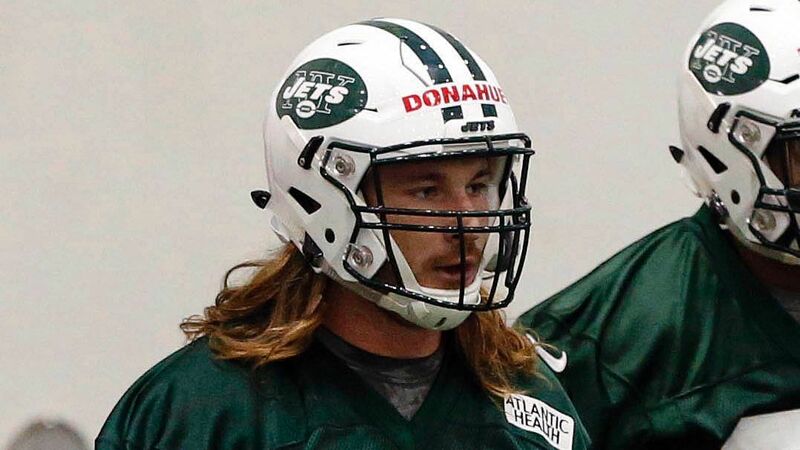 Former New York Jets linebacker Dylan Donahue, who recently pleaded guilty to two DUI charges, has been suspended 14 weeks for violating the NFL’s substance-abuse policy. Donahue, released by the Jets after the last preseason game, is a free agent. A fifth-round pick in 2017, Donahue was arrested twice in a nine-month span. In both cases, he was involved in a car crash. In May, 2017, about a week after being drafted, Donahue flipped his SUV after driving into a parked vehicle in his hometown, Billings, Montana. In February, he crashed into a small passenger bus while driving the wrong way through the Lincoln Tunnel in New Jersey. Per league policy, a two-time offender typically gets a 10-game suspension for alcohol violations, but the discipline can be increased if the commissioner finds aggravating circumstances. Donahue, 26, voluntarily checked into rehab center in Jacksonville, Florida, after the second arrest. In August, he pleaded guilty in both cases to drunk driving, saying at the time that he hadn’t touched alcohol since before rehab. He practiced with the Jets in training camp and played in the preseason games.